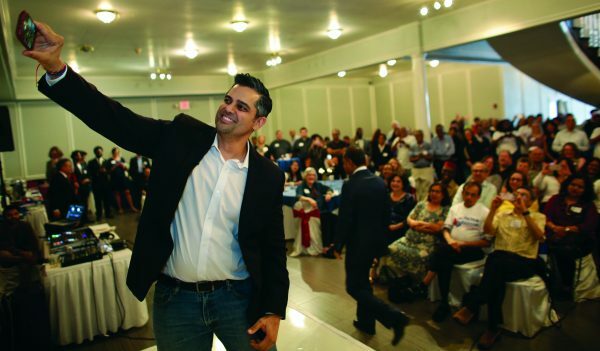 Sri Kulkarni captures a selfie with his approximately 300 supporters, who gathered at Safari Texas to witness the announcement of his candidacy for the 22nd Congressional District. SUGAR LAND – In 1964, George Bush Sr. ran for the US Congress in Texas District 7. Bush Sr. lost that race, but came back as the winner two years later. This historical nugget may be instructive for Sri Kulkarni, former Democratic nominee and United States Foreign Service Officer, who announced his campaign to represent Texas’ 22nd Congressional District at a rally on Saturday, April 6 at the Safari, Texas ballroom. Texas’ 22nd District is located just south of the City of Houston, and covers parts of Ford Bend, Harris, and Brazoria counties. 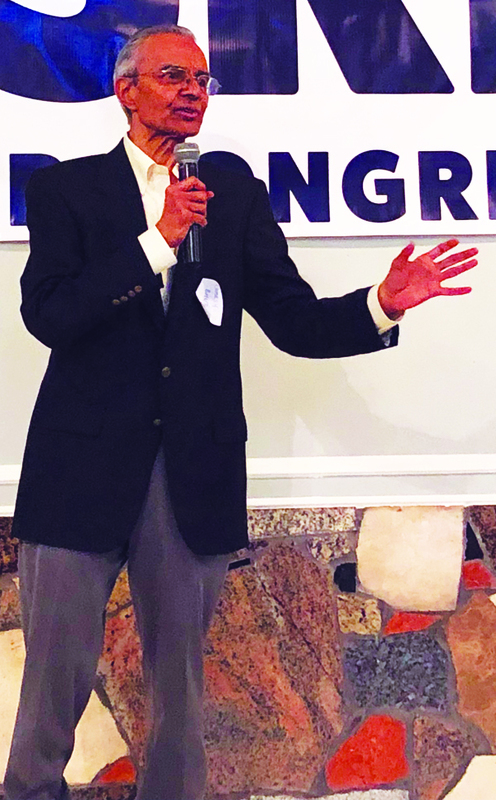 As a political neophyte in 2018, Sri Kulkarni came within 5% points of unseating incumbent Republican Congressman Pete Olson. Kulkarni’s campaign received national attention through his unique attempt to drive minorities to the voting booths. One of the lessons learned from the 2018 campaign was evident at Saturday’s rally with the campaign changing from Sri Preston Kulkarni to just Sri for Congress as a way of making it short and snappy for voters to remember. This time around, Kulkarni also appears to have more support from the Democratic national party, who may be targeting the 22nd district with a legitimate chance of winning for a Democratic candidate. In the 2018 mid-term elections, the Democrats were able to wrest majority control from the Republicans. However, gerrymandering over the years has made it difficult for Democrats to convert the Red districts into Blue. At the campaign rally, the formal portion of the program began with the introduction of contesting various Democratic candidates, who are contesting for Houston city council seats as well as independent school district seats throughout the 22nd Congressional Districts. 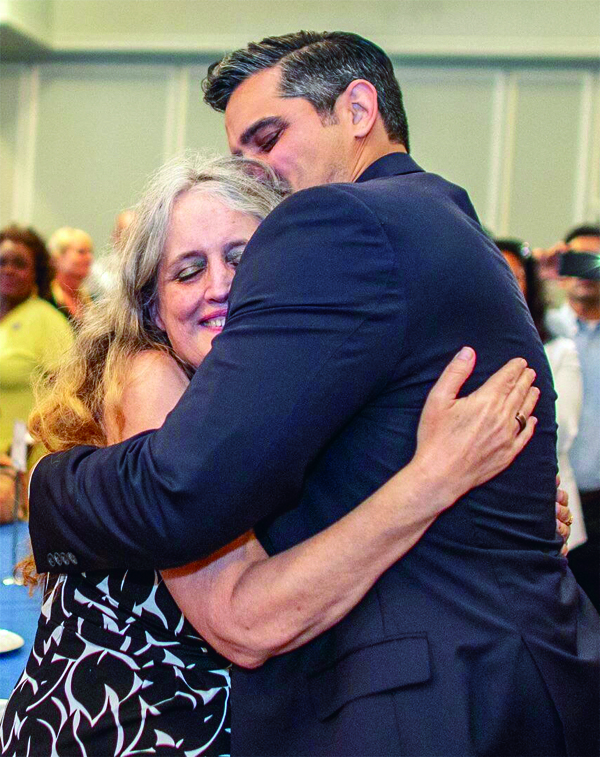 Sri receives a maternal hug from Margaret Kulkarni, who traces her roots to the Texas hero Sam Houston. Several elected officials also took to the podium to voice their support for Sri Kulkarni’s candidacy, including recently elected Judges Julie Matthew and KP George. The audience heard from two individuals who have a strong emotional bond with Sri — Ramesh Bhutada, Chairman and CEO of Star Pipe Products and an iconic Indo-American community leader, and his mother, Margaret Kulkarni. Among the speakers at the gathering was Ramesh Bhutada, who expressed his support for Kulkarni’s inclusive campaign based on diversity. In response, Kulkarni said,” This is the type of cynical politics that we don’t need in our country.